Whoever You Are is a simple yet powerful narrative that addresses diversity while highlighting the vast similarities we share as human beings. 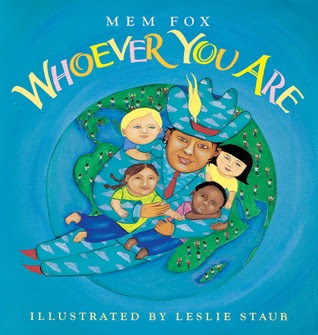 Fox’s words urge young readers to reflect upon the human experience to realize that although we may be from different places or have different appearances, we have many more things in common than not. The book takes us on a journey around the globe to give us a small glimpse of other children’s lives and shows us that however far away or seemingly dissimilar they are to us, every human laughs, cries, feels pain, joy, smiles and bleeds. In my future classroom, I would use this book to support lessons pertaining to celebrating diversity. One activity I may do with my students to emphasize the theme of the story is show them different colored eggs and ask my class to note their exterior differences. Then, I would crack the eggs and spill out their contents side by side to show they are the same on the inside, just as humans are. This activity would help students understand the main idea of the story which is the important message that our similarities unite us and we should not let our “shells,” or exteriors, stand in the way of the connection we inherently share.